Like their system-defined counterparts, custom native ad formats are loaded using GADAdLoader objects. Including the kGADAdLoaderAdTypeNativeCustomTemplate constant in the adTypes array when initializing a GADAdLoader will configure it to request custom native formats when loading ads. 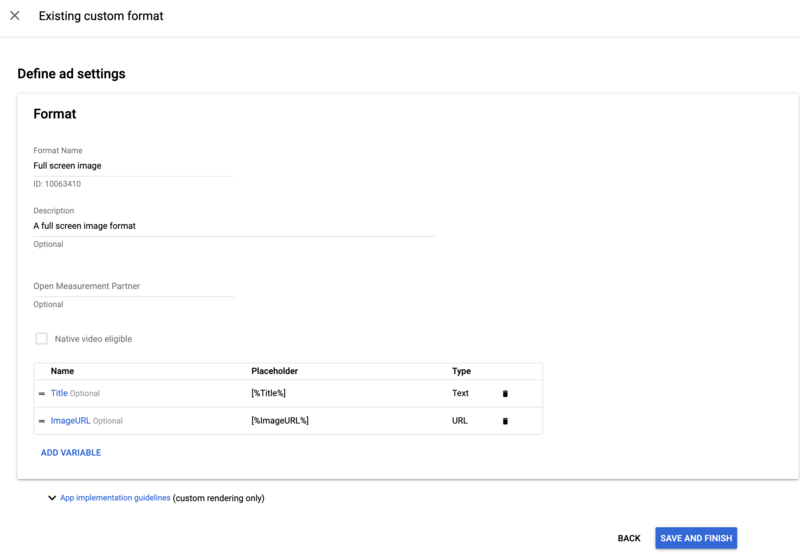 Note: You can request custom native formats and system-defined simultaneously with a single GADAdLoader if you have an ad unit that's configured to serve multiple ad formats. Ad Manager will select the best native creative associated with one of the formats you've requested. Every custom native ad format has a corresponding template ID that identifies it. When this method is called, your app should return an array containing the template IDs of the formats it's prepared to display. From here, individual fields can be added, edited, and removed. Note the Variable ID column to the right. These IDs are used to access the individual assets, and will be discussed more in the next section. Because GADNativeCustomTemplateAd is meant to handle any of the custom native ad formats you create, it doesn't have named asset accessors. Instead, it offers methods like imageForKey: and stringForKey: that take the Variable ID of a template field as an argument. There is no dedicated ad view class like GADNativeContentAdView to use with GADNativeCustomTemplateAd. You are free to use whatever interface makes sense for your user experience. Because there is no dedicated ad view class, you do not need to register any of the views you use to display the ad's assets. 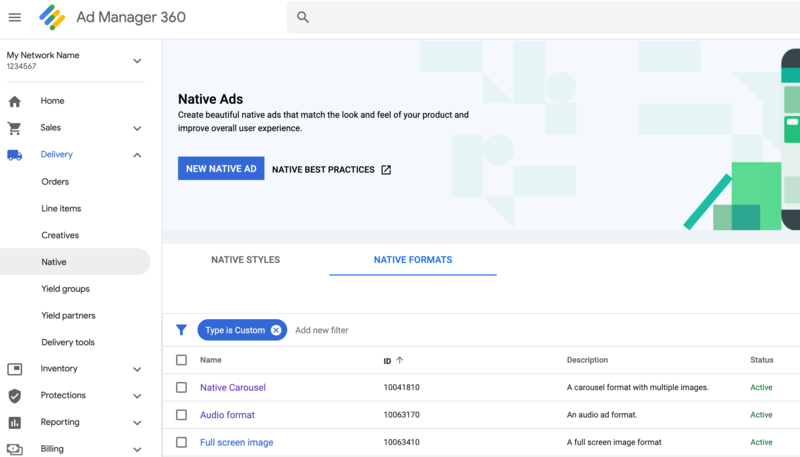 /// Custom native ad view class with template ID 10063170. /// Weak references to this ad's asset views. @IBOutlet weak var headlineView: UILabel! @IBOutlet weak var captionView: UILabel! /// Populates the ad view with the custom native ad object. /// View representing a custom native ad format with template ID 10063170. // Weak references to this ad's asset views. // Populate the custom native ad assets. When creating a new native ad format, you have the option to make the format eligible for video. Simply check the box to make your format video eligible, and when you make a new creative for this format, you'll have an option to provide a video asset. In your app implementation, you can use the GADNativeCustomTemplateAd.mediaView property to get the video's view. Then add this view to your view hierarchy. If the ad doesn't have video content, make alternate plans to show the ad without a video. Note: Unlike app install and content ads, which contain an image in the media view when video is unavailable, a custom native ad's media view has no content if it doesn't contain video. // Assumes your native format has an image asset with the name MainImage. // Assumes you have a placeholder view for your media content. // Remove all the placeholder's subviews. // Size the media view to fill our container size. // Size the main view to fill our container size. See GADVideoController for more information on how you can customize a custom native ad's video experience. Download the Ad Manager Custom Rendering example for a working example of native video in action. For custom native ad formats, your app is responsible for recording impressions and for reporting click events to the SDK. The SDK prevents duplicate impressions from being recorded for a single request, should your app accidentally call the method multiple times for the same ad. Note that you don't need to call this method for every asset view associated with your ad. If you had another asset called "Caption," for instance, that was meant to be displayed but not clicked or tapped on by the user, your app would not need to call performClickOnAssetWithKey: for that view. This is a block (Objective-C) / closure (Swift) that accepts an assetID as an input parameter, which identifies the asset that has been clicked on. Invoke the customClickHandler block in Objective-C or closure in Swift, if one was set. Loop through the ad's Deeplink URLs and open the first one for which a matching app can be found. Open a browser and navigate to the ad's traditional Destination URL. The customClickHandler property accepts a block in Objective-C and a closure in Swift. If you set a block or closure, the SDK will run it and take no further action. If you set a nil value, however, the SDK will fall back to the deeplink and/or destination URLs registered with the ad. message:@"You just clicked on the image!" At first, it might seem strange that custom click handlers exist. After all, your app just told the SDK that a click happened, so why should the SDK turn around and report that to the app? This flow of information is useful for a few reasons, but most importantly it allows the SDK to remain in control of the response to the click. It can automatically ping third-party tracking URLs that have been set for the creative, for example, and handle other tasks behind the scenes, without any additional code. It will serve sample app install and content ads that include the AdChoices overlay. Remember to update your code to refer to your actual ad unit and template IDs before going live! Last updated November 13, 2018.